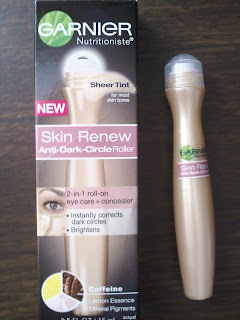 Have you tried the Garnier Nutritioniste Skin Renew Anti-Dark-Circle Roller? Whew, long name ! It's an eye care product & concealer all in one! I've been looking for a great product for a while that can moisturize my bags under my eyes as well as conceals it. I've been using my concealer- mineral makeup- for some time but haven't found anything moisturizing, except eye cream. This is the perfect combination. The roller really cools it and instantly I feel a difference. The one thing I don't like is that I can't keep rolling it around b/c the tint will keep coming out and I don't want it to look too cakey.. I may have to get the regular one (in the green bottle) too! Tip: Do not wear this at night.. the caffeine will give you a jolt that will not be good in the morning.